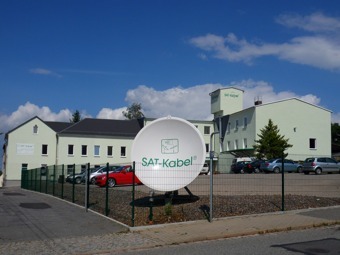 In August 1990, the firm Satelliten- und Kabelfernsehanlagen/Industrievertretung GmbH was founded in Burgstädt at a GDR notary’s office. At that time the company had four employees. The company provides the following services: design and project planning and installation of complete television, radio and satellite receiving systems, electrical systems, and wholesale and retail sale of related products including their repair, the manufacture and sale of component modules, software development, sale of IT products and the operation of broadband cable networks. The firm has now been operating successfully in the market for 25 years. The company has become well known as an engineering consultancy, an industry representative for leading firms, a wholesaler, and installation and service provider. 34 employees currently work in this electrotechnology and IT company. All our employees have many years’ experience in development, project planning, technology, installation and sales. Further subsidiaries are linked to our work. The fundamental principle on which the company is based is to provide a complete service in the field of electrical and telecommunications technology. The firm has six engineers, who ensure the high standard of our operations. Three master craftsmen ensure the quality of our skilled work. All our other employees are qualified experts. We are members of the Electricians’ Guild and the Chamber of Commerce and Industry (IHK). We were entered in the trades register on 20/06/1991 and in the commercial register on 09/01/1991. We offer training in the commercial and trades sectors. Our firm relies on our employees’ many years of practical experience. Constant training means all our staff retain their status as experts in their field. The choice of Burgstädt as our headquarters was no accident; before the reunification of Germany the town was synonymous with the antenna technology industry. Three of the company’s founders had gained many years’ professional experience in the internationally recognised firm Elektronische Geräte Burgstädt. This experience, together with a large helping of self-confidence and the newly created market, provided the driving force behind the founding of the company in August 1990. At first the company rented various premises for a long time until in April 1998, with substantial help from Volksbank Chemnitz eG, they were able to purchase larger premises from the Treuhand (the agency in charge of the privatisation of former state companies) very close to the “old” headquarters. This step was the essential prerequisite for the development of the company’s existing business areas. It made it possible to create a further ten jobs, and with the firm finally in its own premises, investment could be (and continues to be) made each year. 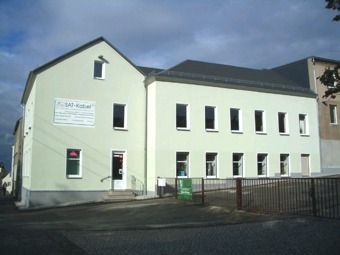 In January 2009 the company was able to purchase the adjoining plot in the direction of Schillerstraße. All the old buildings on the site were demolished and replaced with a company car park and suitable access to the company site even for large lorries. The storage areas and garage complex were also enlarged. Several world firsts have been developed in our company in recent years. These innovative developments are special measuring and testing devices for cable television systems technology. The company owns various patents and utility model registrations in the specialist field of cable television technology. We are certified suppliers of measurement technology for renowned cable network operators in Germany and abroad. The company is actively involved in international and German trade shows for cable, satellite and multimedia technology, for example, as an exhibitor at ANGACable (now ANGA COM), Futura and the FRK Cable Congress. Our presentations at international trade fairs have largely contributed to our success in firmly establishing our products in the European market. Fortunately, physics is the same everywhere, and experts from many different countries recognise the innovative qualities of our products and our slogan, “Practice-based for practical applications – SAT-Kabel GmbH – Your specialist for premium measuring devices”. A further important business area for the company is project planning for cable television systems. Our planning engineers work with AND Professional planning software, enabling us to operate as a single-source provider for technical consultancy, planning, project planning, installation and service. We can cite cable television systems in the following locations as reference projects: Burgstädt and surrounding areas, Oschatz, Rochlitz, Strehla, Eibau, Mildenau, Langewiesen, Marbach, Gera, Klettwitz, Meurow, Cainsdorf, Nobitz, Nassau, Mutschen, Aue, Lunzenau, Chemnitz and Ottendorf-Okrilla. We also carried out project planning for the Maxi Sporthotel in Stuttgart and for Forchheim Hospital. We are currently working on plans for further systems for Tele Columbus AG and Vodafone GmbH. 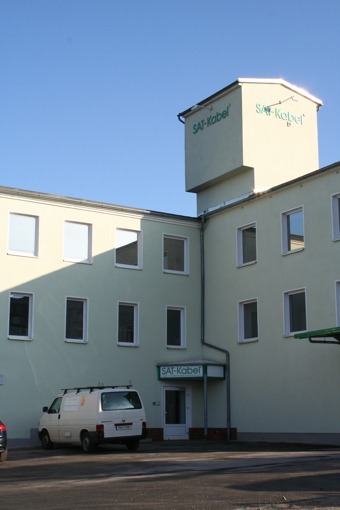 Operating several cable television systems in Saxony with around 15,000 connected residential units is also an important business area for us. This generates a steady annual turnover. In October 2004 high-speed Internet was introduced in the Burgstädt cable TV area as a new telecommunications medium. We are the Internet service provider for this data service. With its network of more than 4,000 active customers in this antenna system, our new Internet service business area has become a crucial essential for other local companies as high-speed Internet access significantly improves the area as a location for business.